1200 - 2000 Sq. Ft.
Godrej Nature Plus, sector 33 Sohna Gurgaon- a new residential project that comes with immense greenery and international lifestyle, here living itself is a blessing, so come and take your family to a ride they always wanted to embrace. Are you sick and tired of that old boring home? Then here is a chance to get a new home space Godrej Nature+ with grand living options like 2 BHK and 3 BHK and each of them is well conceptualized and well formed to serve an ideal and ultra luxury lifestyle that never compromises on quality. Furthermore, the project is well dotted over 17 acres of area with total 1000 apartments and here every tower is standalone that gives a clear view and proper sunlight in every apartment. This project is more than words, so here you will experience nature plus home, plus luxury, plus lifestyle, plus investment and more pluses are there in this exceptional home space to bring high level living. Most important this project is smartly located in sector 33, Sohna also known as South of Gurgaon or Sohna Gurgaon comes with a direct and nonstop connectivity to Gurgaon, Delhi, Faridabad and Manesar. Besides this, here schools, local market, hospital, entertainment hub and more options are within the vicinity and that means here you can enjoy a comfortable travelling and each to the destination on time. School, hospital, local market and bus service adds its own advantage. So come and bring a sea change in your lifestyle because your decision can change the standard of your family. 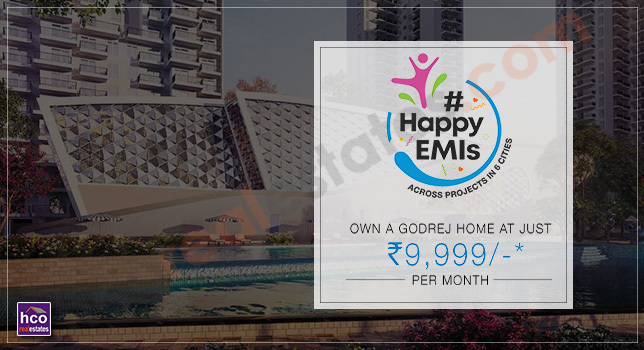 Project with attractive greenery, home situated in more than four walls, space that takes care of your amenities, living space that comes with active sports zone and a home that comes at such an attractive price is definitely a strong address for a strong lifestyle, so come as Godrej Properties welcome a life that is hidden.